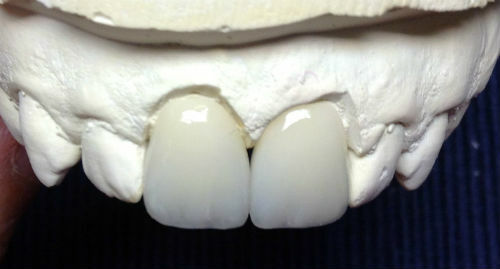 These incisors were made from IPS e.max, or simply e.max. This is the brand name for lithium disilicate, the material used to make these crowns. The shot above compares the final color to the prescribed shade guide. Perfect match. Ready for shipping. The dentist usually prescribes a color that matches the surrounding teeth or restorations. To communicate the desired color between the dentist and the dental lab, we use shade guides. That's what I'm holding just below the two crowns. It's a tool to help everyone talk specifically about color. Without it or something similar like quality digital photos, we'd be stuck saying dumb things like, "make it a little bit less blue." What does that mean? How much is a little bit less blue? 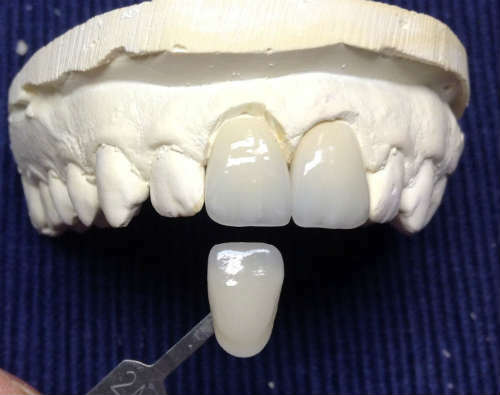 Once the dentist and technician are on the same page regarding color, the technician (me) uses skill, experience, trial and error, and artistic technique to craft a strong, life-like crown in the desired color. The shot above and below give you different views of this case. Above, the front view. Below, from inside the mouth (lingual). In the business, when people like me talk to other people like me, we'll simply call restorations like these porcelain crowns or porcelain jackets. Porcelain is the shorthand we use to describe ceramics-based material, lithium disilicate (e.max) is one of many (and one of the strongest and most popular today). We'll sometimes say Jacket instead of crown because, like a jacket, it wraps around all surfaces of the tooth. Make sure to leave a comment below.